Or you could just blog about it. Either way, this is one of those recipes. I know it doesn’t look like much, a little lumpy and gloppy and overly orange, but this combination of red lentils and cauliflower tastes out of this world, all because of panch phoran. Panch phoran (also spelled panch phoron and panch puran) is a Bengali blend of five spices– fenugreek, mustard, kalonji (nigella), fennel, and cumin, in equal amounts. (In Bengal, radhuni would be used instead of mustard, but it’s not available in the U.S.) You can buy this spice blend in Indian grocery stores or you can make it yourself. Since I would have had to go to the Indian store to buy fenugreek and kolonji seeds, it was just as easy for me to pick up the pre-mixed package for $1.99. When I drop those seeds into a pan of hot oil with a sizzle and a clatter, I am called backward to a time long ago and forward to a time that never was, into memory and dream, into a familiar strangeness. When I smell the wafting song of their voices coming together, I find myself very much at home. It was thanks to Barbara’s evocative essay that I went searching for panch phoron last week. After looking at recipes online and in some of my cookbooks (particularly Madhur Jaffrey’s World-of-the-East Vegetarian), I decided to make a fairly standard dal and add the seasoning to it. 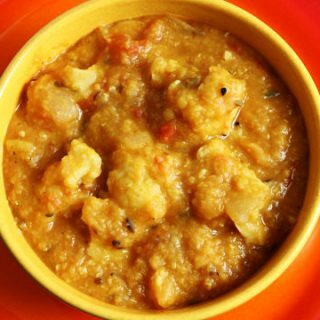 Red lentils and cauliflower are simmered with the Bengali 5-spice blend Panch Phoran in this delicious vegan dal. Pick over and rinse the lentils and add them to a pot with 4 cups of water and turmeric. Bring to a boil and reduce heat to low. Simmer until the dal is tender, about 20 to 35 minutes. When done, add salt and set aside. While the dal is cooking, prepare the vegetables. Heat a large, deep skillet, preferably non-stick. When hot, add the oil and shake it to spread it around. Add the panch phoran and stir. (You may instead use oil spray; spray before and after adding the panch phoran.) When the first seed pops, immediately add the onion, garlic, pepper flakes, and ginger paste. Stir and cook until the onion softens, about 2 minutes. Add the tomatoes, cauliflower, and 1/2 cup water, and stir. Cover and cook until the cauliflower is just tender, about 10 minutes. Tempering the spices in just a tiny bit of oil keeps this dish low-fat while preventing the harsh flavor that can come from burned seasonings. If you absolutely refuse to use even minuscule amounts of oil, you can try dry-toasting the panch phoran, but you do so at your own risk! Each serving is zero points on Weight Watchers Freestyle plan. Hi Susan, I made this last night and loved it. It was even better for brunch today 🙂 THANK YOU. This is amazing and has become my new favorite dish. I literally make a batch each week and have a bowl most days. It is so rich and deep in flavor.. Thank you for sharing! I’ve been dreaming about this lately – picked up a head of cauliflower today! I tried this recipe. It is really good. I especially was glad of the ‘recipe’ for the panch phoran blend. And my husband, who thinks I’ve gone crazy in my new cooking.., he like it too!! 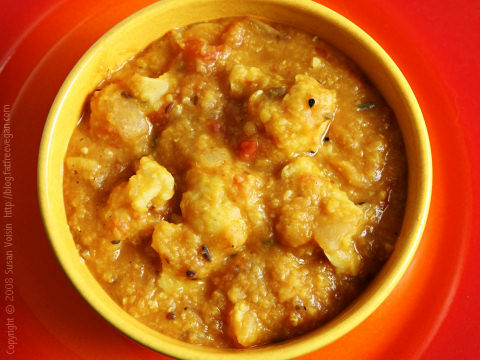 Double thanks..
Lentils – Cauliflower and Panch Poran – what more could you want !!! Finally shared my version.. this is an oftentimes repeated recipe for us, Susan. We increase the spices, though. Thank you so much for such a delicious recipe. Which gets the 4 cups and which gets the 1/2 cup of water ? I assume the lentils get the 4 but just checking. Yes, the ingredient are in the order in which they’re used, but I’ll edit the recipe to be more specific. I am an Indian, i use paanch phoron in number of my dishes….i have never read or thought of such a beautiful description that u guys have written about paanch phoron. These seeds are magical.. I can’t wait to try this recipe. I just ordered Panch Phoron from Spices, Inc., where I get all of my exotic spices delivered to my house (it saves me lots of trips looking for spices, plus the prices are great!) I’m so excited to get my order in the mail and try this recipe. I do have a question. How to you pronounce panch pheron? I’ve looked all over the internet and can’t find a pronunciation. Is it like pawnch (ch as in cheese) four-ON or four-uhn? Or is panch more like pawnk (ch like in chameleon “k” sound?) Just wanted to know how to say it in case I have to verbally share it, ask for it, or explain it! Thanks for the recipe! I really wish I knew! I’ll have to ask the next time I’m buying it at the Indian grocery store. Panch is pronounced as in “Pancho Villa.” The ph is not pronounced like an “f” as in English, but as a “p” , followed by a little puff of air-like “hu”. (P and ph are two different letters in Sanskrit and Hindi.) You can certainly get away with just pronouncing it “poran,” with the emphasis on the second syllable, if it’s hard to get the p-h sound. Made this for dinner tonight….house smells incredible….it’s resting in a covered pan…..rice is in steamer….beer is at the ready…..great Friday meal! 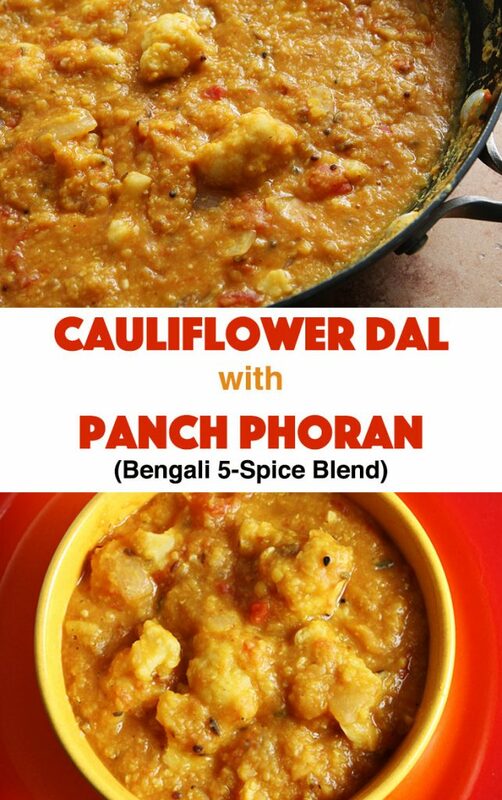 Susan, after reading this post soon after you posted it, I immediately ordered some panch phoran to add to my spice collection and to make this delicious sounding recipe. 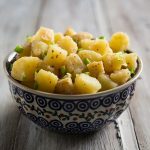 I still haven’t made the recipe, but I did use it in roasting cauliflower and ended up creating a family favorite on my end….even if it did take me til today to actually blog about it. 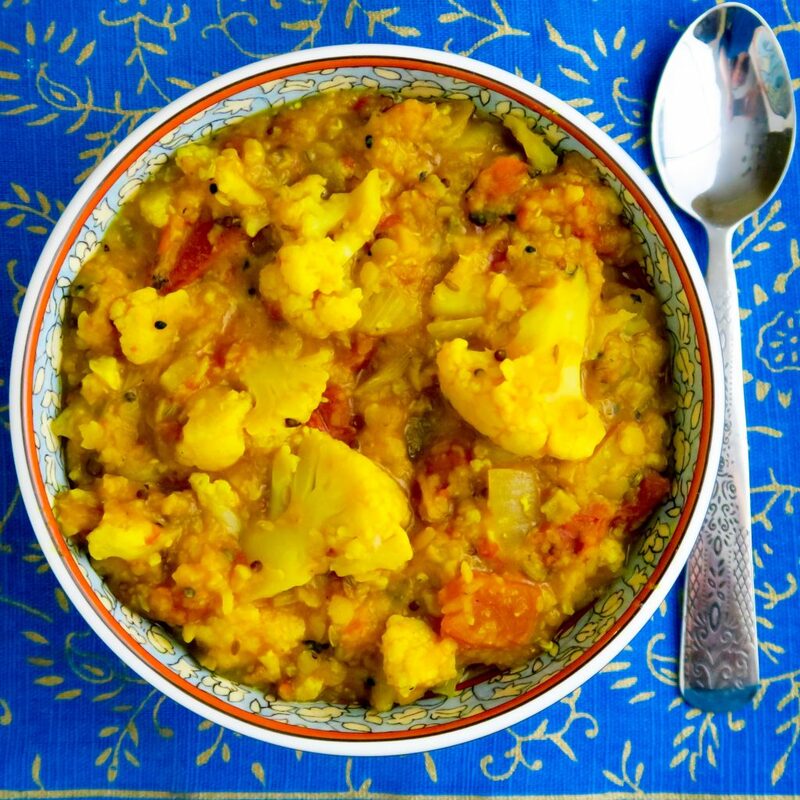 I love this Cauliflower Dal! Just made it for 2nd time tonight. I am wondering if I can make the vegetable part of this and then freeze it? Will it ruin the flavor or texture? I have a lot of cauliflower now so I was wanting to use it. Thanks for a great website. I made this tonight, increasing the panch phoran to 3T, substituting ghee for the oil, and adding a few handfuls of chopped chard toward the end. It was very tasty! Definitely a new flavor profile in my Indian cooking repertoire. Cayenne spices it up nicely too 😉 Thanks Susan! Is the calorie content right for this dish? Without the cauliflower it works out to over 200 cals each according to my calorie counting website. This was so delicious! Thank you for this recipe. I loved it and will definitely make it again! Add panch phoron to a small amount of oil (until the mustard seeds pop) and a dash of Asafoetida (hing) . Throw in cubed zucchini and coat all the pieces with the spices. Cover for a few minutes on medium heat and finish by pan frying the zucchini in it’s own juices until they are slightly golden. It gives it a wonderful nutty flavor! I’ll never have zucchini any other way (diced sweet red bell pepper in the last few minutes of the cooking process makes for a nice addition to the flavors and color). Don’t over cook the zucchini – they should be tender but firm – not mushy. I love this recipe. 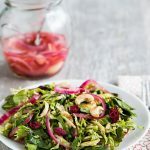 It is a family favorite, so much so that I’ve almost used up a large jar of panch phoran that I purchased when I first found this recipe. I always add the optional ground panch phoran at the end. I think I’ll make this dal again tonight! Thanks for your wonderful blog. Sounds amazing. I was just at New India Bazar on Polk Street in San Francisco last week buying hot curry powder! I’ll have to go back and get the panch phoran. Can’t wait to try this one! 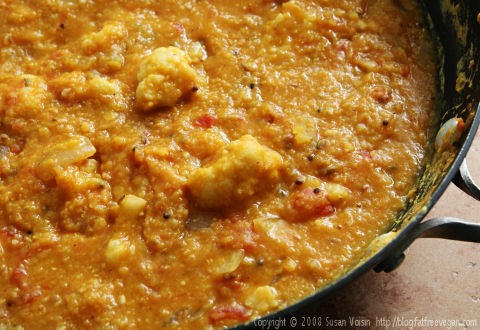 Hi Susan: I made your recipe for Cauliflower Dal with Panch Phoran last night (and had leftovers for tonight). I added lots of baby spinach, a few mushrooms, and served it over Trader Joe’s organic tri-color quinoa. I put it on a big platter in the middle of the table. We not only thought it was delicious, we also thought it looked gorgeous-I think the contrast of the spinach changed the look of it a lot. Is there a way to adapt this to use an Instant Pot? Thank you! So glad to be reading and enjoying your recipes again. 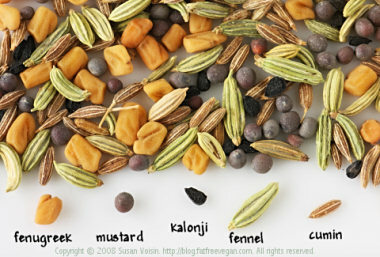 Question: Do you use the whole seeds for all five spices? Love the taste of panch poran, I do a great recipe with panch poran butternut squash with mango and fennel powder – this is next on the list. 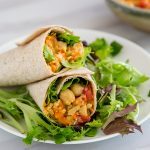 Funny story – Many months ago I wanted to try this recipe so I called several Indian grocery stores to buy panch phoran. None of them knew what I was talking about. Over the weekend I was in the Savory Spice shop looking for a certain curry powder mixture and found it. Luckily I remembered the recipe was from your site, because I am now in business to make this! should the panch poran be ground or used whole? Used whole. For a little extra flavor, you can grind a little extra and add it. So, I have an issue with cauliflower. I really like it quite a bit, but I hate cutting it into florets. I know, weird, but it causes me to buy cauliflower and then have a stand-off with it while it taunts me from the fridge drawer. 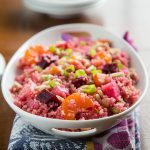 I also never know exactly what I want to do with it, but almost every time, I end up making this recipe when I finally run out of other veggies. I’m always glad I did, ’cause it’s one of my very favorites. Anyway, I woke up this morning knowing we were getting down to the cauliflower part of the week, and started thinking about how this would work in the Instant Pot. IT TOTALLY WORKS!! I toasted the spices using the saute function, threw in the other stuff, cut the cauliflower in 4 hunks (I could have gotten away with leaving it whole – it just fell apart with a spoon), and popped the lid on. I let it go 8 minutes and let it come down some (about ten minutes) before using the quick release. Next time, I’m going to try 5 minutes, because everything was definitely WELL-cooked, but it really came out great. Word to the wise: Don’t do what I did and be distracted while the spices are toasting. A few of mine burned a little bit, so there was a slight bitter note every once in awhile. I have serious constipation and IBS problem. I can’t digest high fibre foods especially bean. Oil is not good for health but seems to lubricate the colon. Do you have any suggestion for my health? I like your fat free receipe but seems too much fibre not for my health. I’m sorry, I’m not a nutritionist or medical professional and can’t offer any medical advice. I hope you find a solution. Just finished a bowl…still enjoying the flavor in my mouth. This is one I’ll actually crave for. I can’t believe I first made this recipe nine years ago and still make it to this day. I recently forward this recipe and site to a friend of mine and I’m so happy to see that you’re still cooking away. Thank you, Susan. I made this tonight and it was hearty, delicious and warming on this cold winter night. Thanks for posting this recipes. The whole family loved it. Any chance you’ve ever made this in an pressure cooker/instant pot and have instructions? So delicious! !